It took longer to write this summary than edit the audio for this slightly under one minute clip of Joe Hager on the “New Waves”. Courtesy of early Airchexx Contributor Andy Bologovsky, here’s another short look and listen to one of America’s great middle-market stations with a huge Major Market sound! 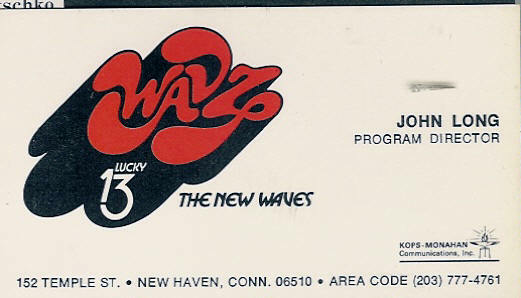 WAVZ was one of a few Southern New England stations within earshot of all the big New York stations, like WABC, WNBC and Hartford’s WDRC. With stations like that competing for local listeners, WAVZ had to be something special. We have other WAVZ airchecks online and we invite you to listen. And comment. My buddy and Georgia Radio Hall of Fame President and founder, John Long was PD here at WAVZ during this time and was a dang fine jock as well.